The project is implemented in 3 villages: The village Hayanist of Ararat marz and the villages Dzoraghbyur and Fantan of Kotayk marz. 2 agronomists from Fantan and Dzoraghbyur and 3 AWHHE members participated in “Networkshop” organized by WECF and Unser LAND UNSER-Women and Rural Development in Germany. Plan for organic farming in Fantan and Dzoraghbyur was developed in Germany with Wolfgang Raddatz, international expert. Later the plan was updated in Armenia with Manuk Harutyunyan, national expert. AWHHE organized international conference on “Organic Agriculture Development and Opportunities in Armenia”. Margariet Samwel and Gero Fedtke participated from WECF. For preparation of the conference AWHHE organized meetings with Garnik Petrosyan, Head of Plant Protection Department of Ministry of Agriculture; Nune Sarukhanyan, Head of NGO “Green Lane”, representatives of the NGO “SHEN” on future cooperation and participation in upcoming international seminar on ecofarming. The total number of participants at the conference was 56, among them there were representatives from Ministry of Agriculture, Academy of Agriculture, as well from project villages and Armenian environmental NGOs. 85% of participants of the Iinternational conference confirmed that they benefit from the conference information. Demonstration plots – Lusine Nalbandyan and Manuk Harutyunyan took samples of the soil from the project 2 villages. Soil samples from Fantan and Hayanist were analyzed in Germany. They conducted 7 seminars in the project villages on organic farming and about works in chosen demonstration plots. Later they visited demonstration plants and orchard in Fantan. Lusine Nalbandyan had 2 meetings with Garnik Petrosyan, Head of Plants’ Growing and Plants’ Protection Department of the Ministry of Agriculture on buying seeds. With his support and advice Lusine contacted with the Selective Station in Gyumri, which is the only state organization in this field. 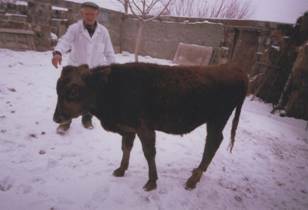 In 28.03.2006 AWHHE bought and transported the seeds from Gyumri to Fantan and Dzoraghbyur. Also, AWHHE bought and transported the biohumus to Fantan and Dzoraghbyur. 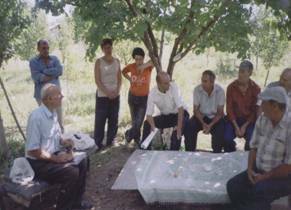 Lusine Nalbandyan and Manuk Harutyunyan had discussions with farmers on work in the chosen demonstration plots. They participated in seed sowing, plant protection (phitotherapy) and watering. 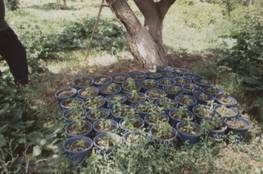 6 injections in Fantan and 6 sprayings in Dzoraghbyur for protection of the trees from diseases and pests by using liquid plants were done. For getting biohumus a vcompost was made in Hayanist. 7 seminars in the project villages on organic farming and about work in chosen demonstration plots were organized. AWHHE had series of meetings and discussions with the NGOs “Armenian Forests” and “Armenian Tree Project” on tree planting possibilities in Fantan. The NGO “Armenian Tree Project” planted two rows of trees (total 550 trees) in Fantan. Amaranth pilot – AWHHE bought and transported the biohumus; soil cultivation; sowing of the amaranth seed and watering were done during the season. As a result of amaranth pilot activities two mowing were made and 80 (1600 kg hay) and 40 packages (840 kg) were received, each weighing 20 kg. In November the works on the use of amaranth as a protein additive to the fodder of the domestic cattle have been started. The portion of amaranth in the second mowing was small, that is why for the experiment a farm was chosen where in the past have been tied 80 packages, i.e. 1600 kg of amaranth hay. The experiment was aimed at confirming the data about the effectiveness of feeding with amaranth. As indicators were chosen the indices of overweight, fattiness and milk yield of the cows. In the farm were chosen two cows, two calves and one pig. The experiment was conducted from the 6th up to the 23rd of November. Till the 6th of November, during a month, there has been a control over the milking capacity of the chosen cows. The average milk yield of the “white” cow made up 9 liters, and of the “brown” cow it was 7 liters per day. On the 6th of November the calves and the pig were weighed. The weight of the “beige” calf was 150kg, and the weight of the “black” one was 80kg. The pig weighed 30 kg. On the same day was checked the fattiness of the milk, which made up 3, 6 % in the “white” cow, and 3, 5% in the “brown” one. Then during the period of 6-23 November the daily portion of the “white” cow was substituted with hay of amaranth by 30%, the portion of the “brown” cow remained the same. The portion of the pig was substituted with amaranth by 50%. At the end of the experiment, i.e. on 23rd of November the fattiness and the milk yield were again checked, which accounted for 3,9 % in and 10 liters in “white” cow, and 3,5 % and 7 liters in the “brown” cow, respectively. During the mentioned period the weight of the “beige” calf was 170kg, the “black” calf weighed 90kg, and the pig weighed 46kg. The whole experiment was conducted under the supervision of the veterinary surgeon. According to the conclusion of the veterinary surgeon, thanks to the use of the amaranth additive to the ration of the animals the indices of the overweight, milk yield and fattiness surpassed the accepted mean values. In particular, the daily overweight was 940 g instead of the generally accepted 500g. However, pilot on amaranth growing was finished because its growing is expensive and not affordable for villagers. Esmeralda Lyulejan and Knarik Grigoryan disseminated amaranth seed for cooking and sewing in Fantan (61 kg), Dzoraghbyur (50 kg) and for sowing in Hayanist (40 kg). At the same time leaflets for usage of amaranth seed were disseminated. Monitoring was conducted on the use of Amaranth in three villages: Dzoraghbyur, Fantan and Hayanist in last months of 2006. After the monitoring there was a partial change in the list of the children who wanted to use Amaranth. Also was made a list of the adults, the inhabitants of c. Yerevan, mainly those who suffer diabetes and wish to use Amaranth in their food. Among 100 households in Dzoraghbyur 63% wanted to receive Amaranth for cooking. 115 households of Hayanist that received Amaranth in May and all of them wished to receive again. All recipients of Amaranth in Fantan (44 households) also wanted to use again. Stevia -The bushes of stevia that were grown in the open ground were cut and covered with soil. The bushes of stevia that were grown in pots also were cut and removed into a closed building for winter storage. After stevia blossoming in October 250 seed were received for further planting.